St. George’s Church is a former parish church designed by Francis Johnston, and considered to be one of his finest works. The elegant spire, 200 feet high is a landmark of the north inner city. 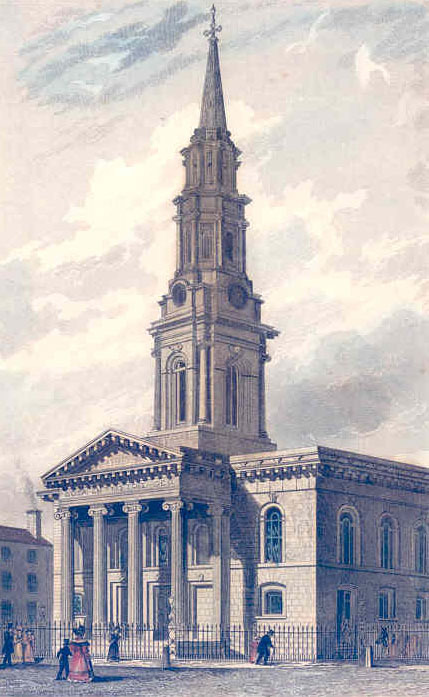 Construction of the church commenced in 1802 by the Church of Ireland for the parish of St. George, which had been established in 1793. There had been a chapel nearby dedicated to St. George for some time before that, in present-day Hill St., erected by Sir John Eccles, of which now only the tower remains. Twenty-two years after the church was built problems developed when the wide roof began to splay further than it should, due to the strain of the wide-span timber trusses. Civil engineer Robert Mallet, whose father ran an iron foundry in Dublin, created cast-iron trusses to haul the church back into shape. In the 1980s scaffolding had to be erected around the spire because the Portland stone was cracking due to expansion of the iron cramps that held it in place. The Church of Ireland, having tried in vain to raise funds for the restoration of the church, sold the building in 1991 to an actor, Sean Simon, who had plans to turn it into a theatre. After its deconsecration, the bells (which Leopold Bloom heard ringing in Ulysses) were removed to Taney Parish church in Dundrum, while the ornate pulpit was carved up to decorate Thomas Read’s pub in Parliament Street. The church then became the Temple Theatre, then a night-club, but further attempts were made to raise public funds for its restoration; first, in 1991, to celebrate Dublin’s role as European City of Culture, and later from the Millennium Committee. After a recent restoration, the scaffolding was removed from the spire for the first time in over twenty years.